The University of Maine football team is traveling to Eastern Washington University to take on the Eagles in the FCS semifinals. The field at EWU is a little different than most. When the Black Bear football team takes the field on Saturday at Eastern Washington University, there's no doubt, they'll be seeing red. 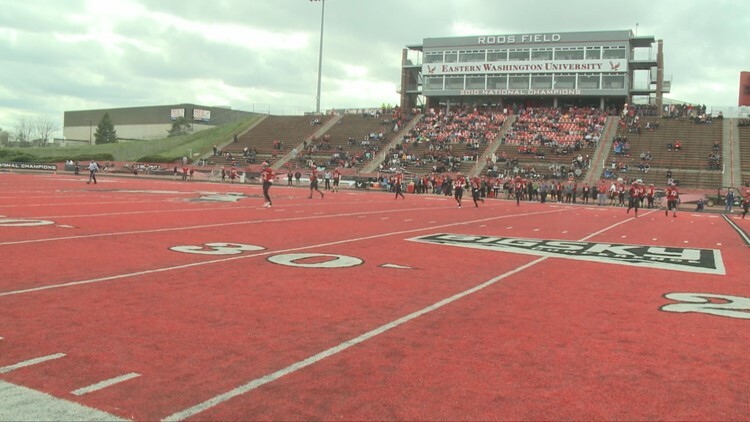 That red won't just be coming from Eagles fans wearing their team's color, but the field at EWU is blood red. "When I first seen it on film I was like, what a red field? Like, I don't know how I like that." Junior defensive back, Manny Patterson says laughing. The Roos field was built in 2010 and is named after All-Pro NFL tackle and EWU alum, Michael Roos, who was a major donor of the red field. The turf is nicknamed "the inferno" but what is it like to play on? NEWS CENTER Maine asked an expert. "Contrast sensitivity could be an issue because these kids their whole lives have been playing on a green grass or a green turf vs. bright blood red." Dr. Sean Kull, optometrist at Kull Family eye, said. While the contrast sensitivity may effect someone looking directly at the ground the entire game, football players are looking around while they play. "The good thing about football is, um, from a visual standpoint most of the time players vision is directed upward or parallel to the ground." Kull said. "A quarterback when he's surveying the field he's not looking down at the grass, or the red turf. He's looking up in the air. When a receiver is going to catch a ball, it's in the air." The only problem players might face is the similarity of the color of the ball and the field. "If a ball was rolling or tumbling down the field like on a kickoff or a punt return or lets say a fumble." Kull said. But the team, isn't worried. "It's gonna be a little weird but I think we're going there early so we're gonna get that Thursday and Friday to kind of prepare and see it and you know once our eyes adjust pregame, I don't think it'll be a problem." Sophomore quarterback, Chris Ferguson, said. "It don't bother me a field is a field we can play on grass or turf. We can go out in the parking lot." Senior defensive back, Jeff Devaughn, said. Red field or not... the Saturday game is history-making for the Black Bears. ... the first time the team has made its division semi-finals.